Alongside Our Celebration for the birthday of the NHS, we continue to champion its future. Our NHS faces increasing demands with decreasing resources and bit by bit it is being sold off to private providers. Our free and public health service is under incredible strain, lower bed numbers than denand, surgery being cancelled, nurse numbers down. Everyone working in our hospitals are working flat out with growing strain. Despite the fantastic work of our doctors, nurses and other healthcare workers, the conditions they are working in, the budgets they are working with are not meeting the demand. The student NHS bursary is gone, nursing numbers are falling, as the population ages and we need more. The prospect of a US-style healthcare system run in the interests of businesses is very real. As Jeremy Corbyn said, we must oppose any move to create “an NHS where they feel for your purse before they feel for your pulse”. It is easy to take the NHS for granted – it can feel as though it has always been here. That’s why we must remind ourselves that the NHS is a triumph of modern history, and it is only through our collective strength that it will survive. 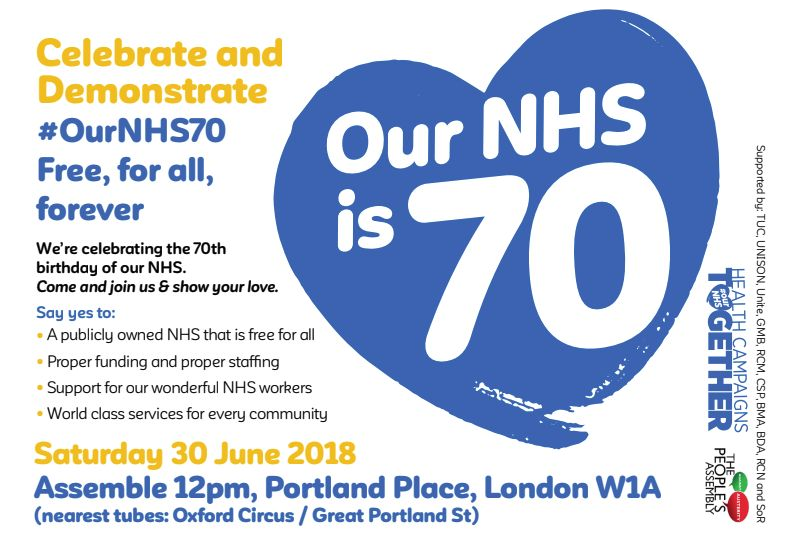 Together with many others we will be joining in on the 70th Anniversary of our NHS – celebration and protest. A joint event called by Health Campaigns Together and People’s Assembly. Coaches will be going from Swindon, if you care about our NHS, do get in touch & join us.